Grammy's Attic: Digging In or Out? Happy New Year to all of you! The first day of 2019 and the first day of our new January monthly challenge at 2 Crafty Critter Crazies! Our theme is always "Anything Goes" and this month our sponsor is Bugaboo Stamps. They have their own challenge going - a Bingo board - which will be open through Friday. I used the top row of that board to make my card - Texture/ No dp/ & a Bugaboo Stamps image. I love their cute images and have a quickly growing collection of them. They generously provided the DT with images to use for this challenge and I'm using "Winter Bird Friend." I colored with ProMarkers and water colors, then used a die from CUTplorations to cut the image. I inked the edges and turned it on an angle on a square card. I printed the sentiment, hand cut it, and inked the edges of it. I added the three, sparkly snowflakes and beyond that, left it CAS. Happy New Year my dear friend! A fabulous card, just love the image and brilliant sentiment. So cure and so much fun. Love that chubby looking little bird. Too cute. 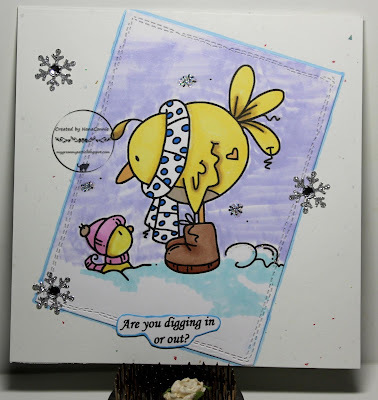 What a cute card, I love the big scarf that the bird has on along with those big boots!! What a darling card! The image and sentiment are so cute! Really glad it's not that cold here. Thanks for sharing at Jo's Scrap Shack. what a cute scene and card. Thank you for playing with AAA cards. You always create such fun and happy cards Love it! Thanks for playing at AAA Cards.. Your card is as cute as can be. I love the sweet image and your sentiment. Great job. Such a lovely card. I love it. Love the background, Thank you for play with us in Pink Gems Challenge blog. Good luck with your entry.